Scott Howson's vision for the Columbus Blue Jackets simply never came to fruition. Despite a star (Rick Nash) already in place and numerous high picks at the NHL Draft, Howson's clubs qualified for the Stanley Cup Playoffs just once - and got swept. June 15, 2007 - Howson is named the second GM in Blue Jackets' history. He replaces Doug MacLean, who was fired in February of that year. June 22-23, 2007 - Just one week after being hired, Howson finds himself at the draft table. 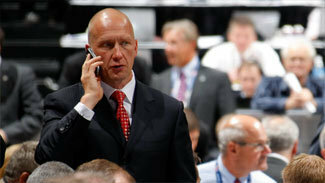 He uses the seventh overall pick on right wing Jakub Voracek, who plays only three seasons in Columbus. His next six picks that year have played a combined 33 games in the National Hockey League - Maksim Mayorov and Allen York were the only two to reach the NHL level. April 6, 2008 - The Blue Jackets conclude the 2007-08 season with a 4-1 loss to the St. Louis Blues at Nationwide Arena. Columbus finishes 13th in the Western Conference with a record of 34-36-12. June 20, 2008 - The Blue Jackets acquire center R.J. Umberger and a fourth-round pick in the 2008 NHL Draft from the Philadelphia Flyers in exchange for first- and third-round picks in 2008. The Blue Jackets still possessed the sixth overall pick, which Howson used to select Nikita Filatov, who scored six goals (three in one game) over the course of three seasons before being traded to the Ottawa Senators. Filatov was one of nine players drafted by Columbus that weekend - left wing Matt Calvert, a fifth-round pick, leads the list with 65 games played in the NHL. July 9, 2008 - Columbus signs coach Ken Hitchcock to a three-year contract extension through the 2011-12 season. April 8, 2009 - Rick Nash's goal at 14:30 of the third period erases a 3-2 Chicago lead and forces overtime, resulting in the Blue Jackets clinching the first playoff berth in franchise history. They finish the regular season with a record of 41-31-10, good for seventh in the West. April 23, 2009 - Columbus is swept in the Western Conference Quarterfinals after suffering a 6-5 loss to the Detroit Red Wings in Game 4 at Nationwide Arena. The Blue Jackets allow 18 goals in the four games. June 26-27, 2009 - The Blue Jackets use their first-round pick (No. 21) to select defenseman John Moore from the Chicago Steel of the United State Hockey League. July 3, 2009 - Captain Rick Nash signs an eight-year contract extension to remain with the Blue Jackets through the 2017-18 season. Oct. 3, 2009 - Columbus signs Rostislav Klesla to a four-year contract extension through 2013-14. Dec. 29, 2009 - Blue Jackets acquire forward Chris Clark and defenseman Milan Jurcina in exchange for forward Jason Chimera. Feb. 3, 2010 - Howson fires Hitchcock after 58 games (22-27-9). Claude Noel is named coach on an interim basis. March 3, 2010 - Blue Jackets acquire Nathan Paetsch from Buffalo in exchange for Raffi Torres. Columbus also gets a sixth-round pick for Milan Jurcina and a conditional seventh-round pick for Fredrik Modin. The Blue Jackets also acquire Matt Rust and Chad Kolarik in two separate deals. April 9, 2010 - Columbus ends its season with a 1-0 shootout loss to Detroit at Nationwide Arena. The Blue Jackets finish with a record of 32-35-15. June 8, 2010 - Scott Arniel is hired as coach. He signs a three-year contract. June 25-26, 2010 - The Blue Jackets use their first-round pick (No. 4) to select center Ryan Johansen from Portland of the Western Hockey League. Sept. 20, 2010 - Goaltender Steve Mason is signed to a two-year contract extension. Nov. 24, 2010 - Jakub Voracek's overtime goal against the New York Islanders gives Columbus its 14th win, the franchise's best start to a season after 20 games. Jan. 11, 2011 - The Blue Jackets suffer a 4-3 loss to the Phoenix Coyotes on home ice. It is their fifth consecutive loss (all in regulation) to start the new year. Feb. 28, 2011 - Columbus trades Klesla to Phoenix for Scottie Upshall and Sami Lepisto. The Blue Jackets also acquire Greg Moore and Michael Chaput from the Flyers for Tom Sestito. April 9, 2011 - The Blue Jackets conclude the 2010-11 season with a 5-4 loss to the Buffalo Sabres at Nationwide Arena. They finish with a record of 30-44-8, 13th in the West. June 23, 2011 - On the eve of the 2011 NHL Draft, the Blue Jackets acquire Jeff Carter from Philadelphia for Voracek, the Jackets' first-round pick (No. 8) and a third-round pick. "Jeff is a proven No. 1 center in the National Hockey League and we look forward to him having many productive seasons as a Blue Jacket," Howson said. June 24-25, 2011 - The Flyers use what would have been the Blue Jackets' first-round pick on center Sean Couturier. Columbus doesn't pick until the second round, when it grabs center Boone Jenner at No. 37. Oct. 20, 2011 - Carter goes on injured reserve due to a fractured foot. He misses almost a month. Nov. 5. 2011 - The Blue Jackets allow five goals in the first period en route to a 9-2 loss at Philadelphia. Sean Couturier scores twice. Jan. 9, 2012 - Arniel is fired as coach after an 11-25-5 start to the 2011-12 season. He is replaced by Todd Richards on an interim basis. Feb. 23, 2012 - Eight months after acquiring him from Philadelphia, the Blue Jackets trade Carter to the Los Angeles Kings for defenseman Jack Johnson and a 2013 first-round draft pick. In 39 appearances, Carter had 15 goals and 10 assists. April 7, 2012 - Columbus beats the New York Islanders 7-3 in its regular-season finale, but once again fails to qualify for a playoff spot. The Blue Jackets finish with the worst record in the NHL at 29-46-7. April 10, 2012 - With the best chance at landing the No. 1 pick at the 2012 NHL Draft, the Blue Jackets learn they will select second after the Edmonton Oilers win the draft lottery. May 14, 2012 - The Blue Jackets officially name Todd Richards coach. June 22, 2012 - Columbus receives goaltender Sergei Bobrovsky from the Flyers in exchange for second- and fourth-round picks at the 2012 NHL Draft, as well as a fourth-round choice in 2013. June 22-23, 2012 - The Blue Jackets use the second overall pick on defenseman Ryan Murray from the Everett Silvertips of the Western Hockey League. July 23, 2012 - After months of speculation, the Blue Jackets trade Nash, their captain, to the New York Rangers. In exchange, Columbus receives forwards Brandon Dubinsky and Artem Anisimov, as well as defenseman Tim Erixon and a first-round draft pick. Oct. 24, 2012 - The Blue Jackets name John Davidson president of hockey operations. Nov. 21, 2012 - Murray suffers a season-ending shoulder injury while playing for Everett of the WHL. Jan. 19, 2013 - Columbus opens the 2012-13 season with a 3-2 shootout win at Nashville. The Blue Jackets went on to lose their next four games. Feb. 6, 2013 - After tallying just two assists in 10 games, former first-round pick Ryan Johansen is sent down to Springfield in the American Hockey League. Feb. 11, 2013 - The Blue Jackets earn just their fourth win of the season, a 6-2 victory against the San Jose Sharks at Nationwide Arena. Feb. 12, 2013 - Howson is relieved of his duties as executive vice president and general manager. The Blue Jackets compiled a 174-190-59 record during his tenure.